Aplastic anemia is basically a very serious condition affecting the bone marrow. It is a condition where the bone marrow in an individual loses the ability of making sufficient new blood cells. Children who suffer from Aplastic anemia have less oxygen sent to the cells, organs and the tissues because of fewer blood cells. Children who have Aplastic anemia are at an increased risk of different bleeding problems and infections. 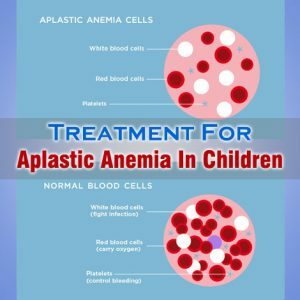 There are many causes of Aplastic anemia in children and these include autoimmune diseases like rheumatoid arthritis and lupus; liver infection; viral illnesses; medicines; chemotherapy and radiation therapy and toxins like benzene, pesticides and heavy metals. Marrow and blood stem cell transplants might cure Aplastic anemia in a child but provided the child is eligible for the transplant. Getting the known cause of Aplastic anemia removed from a child’s body like exposure to toxin can always help in curing the condition. Antibiotics are also one of the best options of Aplastic anemia treatment in children. Antibiotics are of good help in fighting infections that cannot be defeated by the white blood cells. They come as the best help for children with Aplastic anemia. Transfusions of the red blood platelets and the red blood cells can be of good help in reversing bleeding problems and anemia. Blood transfusion is a procedure of giving only red blood cells or whole blood to the patients by making use of intravenous line. The medicines for stimulating the bone marrow like colony-stimulating factors and erythropoietin can help in getting easy riddance from Aplastic anemia in patients. Medicines for suppressing the immune system can also be used for relieving the symptoms of Aplastic anemia and for reducing the complications.